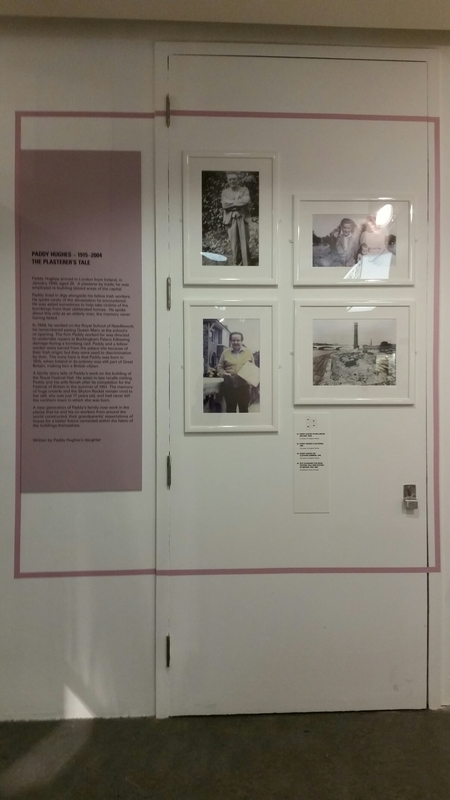 While attending the Web We Want Festival in the Southbank Centre on Saturday morning last, I happened across a large exhibition entitled ‘Adopting Britain – 70 years of migration’. 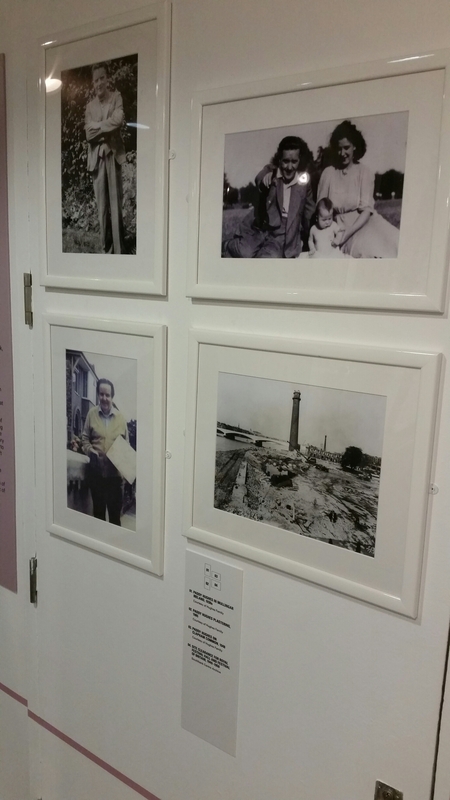 It documented stories of immigration from countries throughout the world, as well as attitudes towards immigration, using pictures, written stories, audio, video, physical artefacts and more. 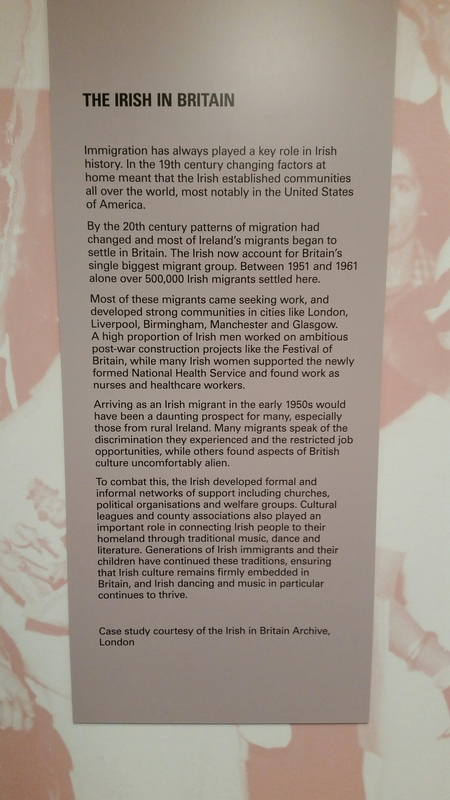 But what caught my eye above all else, was a full section devoted to the story of Irish immigration. 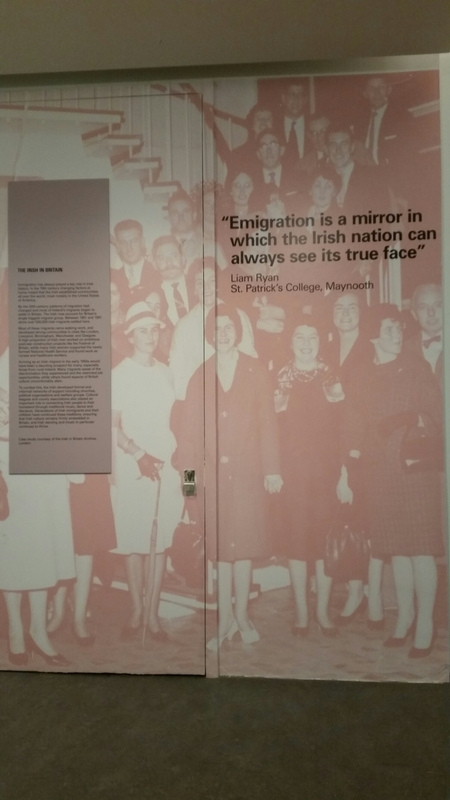 While it was far from in-depth, it gave a flavour of the colourful story of Irish immigration, albeit from a previous generation as opposed to the current generation of Irish exiles to Britain. 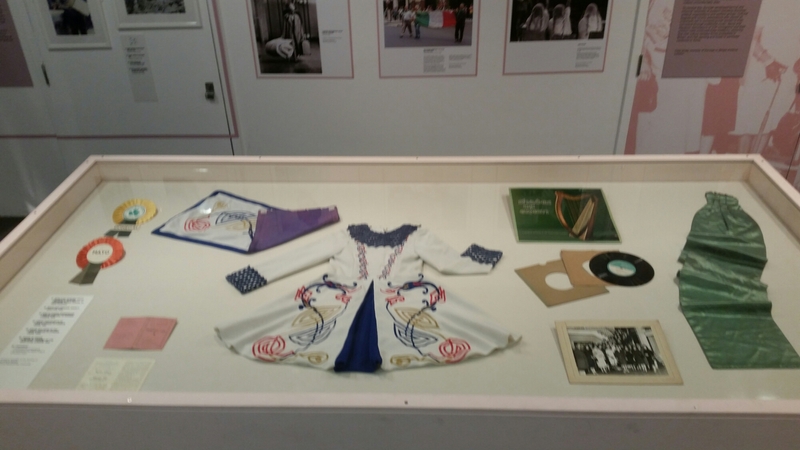 These pictures document the entire Irish section of the exhibit and many people might feel that it doesn’t reflect their experience at all, especially those from the current generation. Again, as part of a much larger exhibition, it does its job of providing a flavour of what is a very rich and complex history. 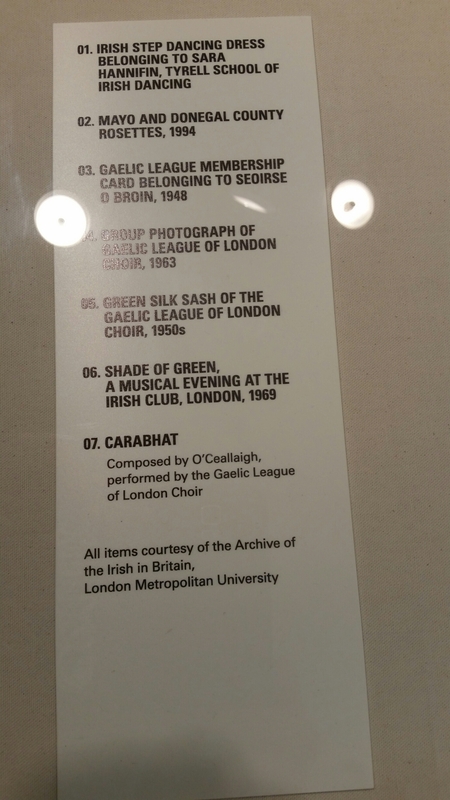 By happy coincidence, I also had tickets for that evening’s performance of ‘My English Tongue, My Irish Heart’ at the London Irish Centre, in Camden Square. This was a different story altogether as it really got to the heart of many of the complex issues associated with ‘taking the boat’ and did it in a way that all generations could relate to. Written and directed by Northern Irish dramatist Martin Lynch, the play sought to inform and even surprise the audience with its rich wealth of facts and history about Irish emigration. It is based on a book, The Literature of The Irish in Britain: Autobiography and Memoir , 1725 – 2001 by Dr Liam Harte but above all else, it was a very entertaining production, laced with typical Irish humour and some excellent ballad singing. 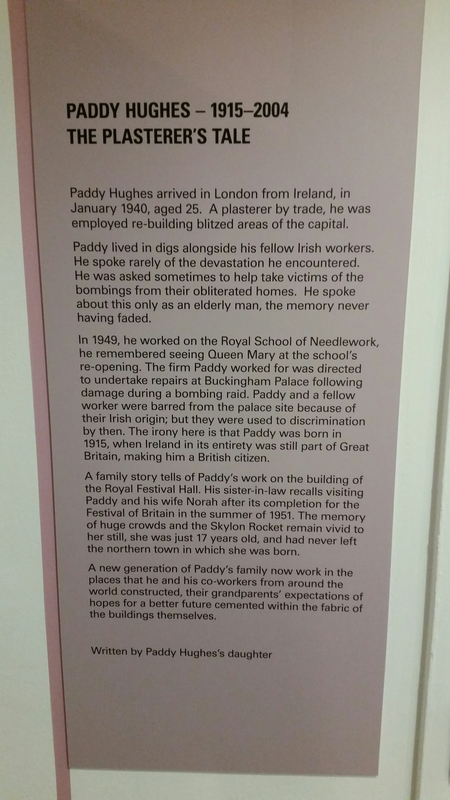 Only five actors were involved but they played the parts of countless characters, all historical figures that have left their mark on the rich history of Irish emigration to Britain. 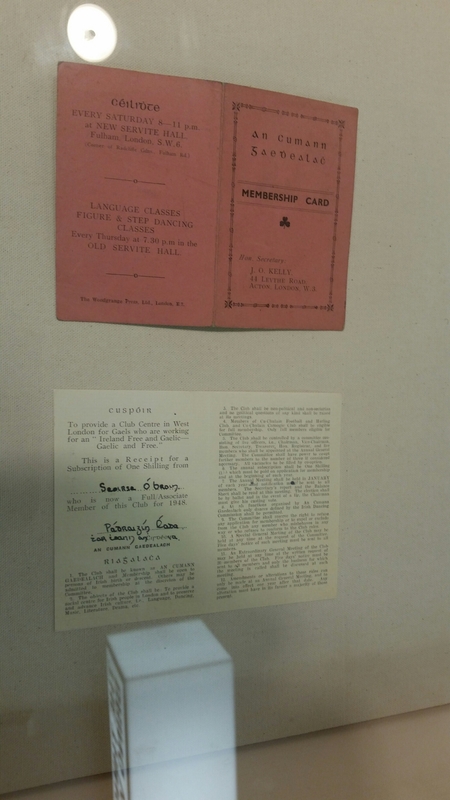 The historical storytelling was interspersed with the main narrative, that of a young couple who meet in NUI Galway and whose lives and relationship are shaped by the threat of emigration as well as emigration itself. Gary (Cillian O’Dee) is a Catholic from Mayo, Susan (Kerri Quinn) a Dungannon Protestant and the cross-border-cross community element added hugely to the complexity of the wider story. This was a thoroughly enjoyable production and it is just a pity that it only ran for 3 nights in London and is now finished its tour of Ireland and Britain. It would be great if it did another run so that more people could see it (I would definitely see it again). It would also be great if a film production company took a look to see if the story has potential in a more widely shareable format. You can read more about the play through Green Shoot Production theatre company’s Facebook page, which has links to various articles about the production.